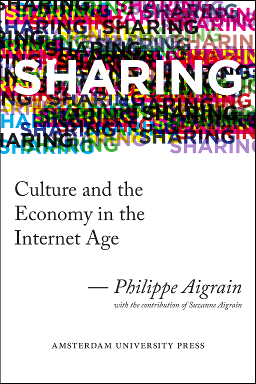 Sharing: Culture and the Economy in the Internet Age is a book by Philippe Aigrain with the contribution of Suzanne Aigrain. It has been published on February 1st, 2012. Sharing provides a new view on the legitimacy of non-market sharing of digital works between individuals. Sharing takes stock of recent economic knowledge on the culture economy. It provides an original perspective on financing schemes adapted to the enlarged set of contributors and more diverse attention to works that characterize digital culture when it can be freely shared by individuals. a dedicated “live book” website at http://www.sharing-thebook.net, where you can comment on the book chapters, download source code and datasets, and run interactively our models with parameters of your choice. For a preview of some topics discussed in Sharing, watch the video on the media page of the book site. See also the book entry in Amsterdam University Press catalog and in Chicago University Press catalog (US distributor).